Musings from the workbench of violin maker Andy Fein on makers, instruments, bows, musicians, and the joys of a life in the world of stringed instruments. Cameo appearances by the musicians on staff at Fein Violins. As of a little over three weeks ago the Spanish Royal Palace is faced with a problem that has classical musicians everywhere cringing: the 1694 Stradivarius cello known as the "Spanish" was severely damaged during a routine photo shoot. While the cello was being positioned alongside its counterparts, the two violins and viola of the "Spanish Quartet," it was knocked off its side from a table onto the floor. The history of the Spanish Quartet is an interesting narrative in itself. King Felipe V of Spain intended to visit Cremona in 1706, and Stradivarius began work on an entire concerto of instruments (ten to fifteen stringed instruments) to commemorate his arrival. Before Stradivarius was finished with his project, however, the King announced that his visit would take place in 1702, four years early. 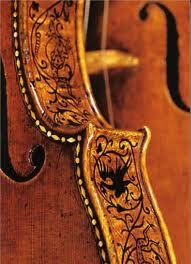 Stradivarius had completed only five instruments by the time of his arrival. The two violins, two violas, and cello were given to Stradivarius' son Francesco until they were sold by the Stradivarius family to a Cremonese monk by the name of Bambilla. By this time the instruments had fallen into a state of considerable disrepair, but Antonio Stradivarius' original intentions became reality as the Spanish monarchy purchased the set for a young Prince Carlos. The court trusted another priest, Vicenzo Ascensio, with restoring the quintet to playable condition. Ascensio wished to convert the instruments, which were made from Stradivarius' long patterns, to more contemporary dimensions. Prince Carlos insisted on keeping them original despite Ascensio's otherwise immaculate restorations. The cello, however, was later reduced in size by Ascensio's protege, Ortega. The quintet remained in the hands of the Spanish monarchy until one of the violas was robbed by Napoleon as the Royal Palace was under siege, but the remaining four instruments comprise the Spanish Quartet that resides there today. The whereabouts of the lost viola remain unknown. Despite the extent of the damage to the instrument the repairs could be described as routine. 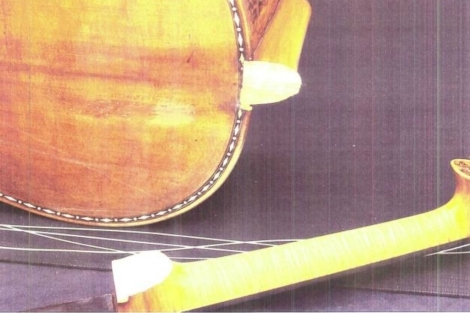 The neck of the cello separated from the body of the instrument at the seam of a repair completed in the nineteenth century, but further damage has not yet been identified. While the Spanish's 200 year old neck was an integral component of the instrument it was not, however, the original carved by Stradivarius. Some may take comfort knowing that the pristine perfection of an all-original Stradivarius was not lost and that the reattaching of a neck is a somewhat common restorative procedure. While the repairs are likely to be an extensive, expensive process, the Spanish Royal Palace has not released a timeline or price tag for the fix. Sotheby's Auction House and the Spanish Royal Palace's curator have valued the priceless--expensive, rather--cello at no less than $20 million (13 million euro), a label far exceeding that of any Stradivarius sold before (cello or otherwise). This shockingly high appraisal may, however, prove to be deceptively modest compared to evaluations of instruments that will be sold in the future. As the Spanish demonstrates, it sometimes takes a paradigmatic event for the value of one of these iconic instruments to be assessed, whether it be to put the instrument on the market or to make an insurance claim. As such there are many Stradivarius, Guarneri, Amati, Guadagnini, and other makers' instruments of the same caliber tucked safely away in collections or in performers' hands that are unavailable as a basis of comparison when auction values or insurance appraisals are discussed. In other words you may want to keep your shock and awe hidden and invested for the years to come; there could very well be even bigger numbers around the corner. What are Violins, Violas, & Cellos Made Of? All images displayed on blog.FeinViolins.com are either owned by Fein Violins, Ltd. or are readily available in various places on the Internet & believed to be in public domain.